We have been monitoring Michael’s voice to get him back on the stage. Had a specialist check him again & in his opinion Michael should not sing for a few months. He has a node on his vocal chords and could do irreparable damage doing a 75 city Tour right now. Michael is obviously devastated. I know all of you join us in feeling for him in his disappointment, and wish him a full and speedy recovery. Just a quick message to all those who were looking forward to seeing me perform on this tour. I’m so upset that I won’t get to see you all. 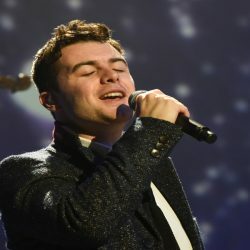 I knew that Celtic Thunder fans were special but this experience has shown me that you all are in a league of your own. To all the street teamers, fans of Michael O Dwyer and all the other amazing groups and individuals who went to the effort of making a badge, piece of artwork, a card, sent a message, etc. Please note that your generosity has not gone unnoticed and I am so grateful for the effort you all put in. I am so lucky to have such an amazing fan base who are so understanding. And I can’t wait to recover so I can see you all again. I am humbled also by the support shown by my colleagues. David, Sharon, Neil, Ryan, Emmet, Damian and the rest of the Cast and Crew. Having to rework an entire show was a lot of work for everyone. Having to redistribute the vocal lines and harmonies in every ensemble song and add songs to replace my solos, along with all the new choreography to be learnt was a Herculean task! Not that I ever doubted the guys were up to it, but it was all so last minute, and I will be forever grateful for the good grace and compassion they afforded me while they did it. Absolute Pros and the best people you could ever want to have your back. The overwhelming generosity of spirit from everyone has made this crushing disappointment a little easier to bear.